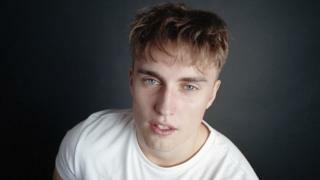 Sam Fender has thoughts... and he's not afraid to share them. Jamie Oliver comes in for similar treatment from the singer, who recently appeared on Later... with Jools Holland and has had two hottest records of the week on Annie Mac's Radio 1 show. "Jamie Oliver says £10 for a meal for two people is a cheap meal - that's a lie, it's not cheap. "Imagine trying to feed a family of six - that's like ridiculous amounts of money. And then imagine living on jobseekers!" "We're just more exposed - social media really exposes people because your everyday life is shown and you realise we're in this vanity trap. Part of the attraction to Fender is the honest and vulnerable nature of his music. His haunting voice relates issues not covered by other songwriters - male suicide in Dead Boys, for example. Or the fear of never getting out of your home town in Leave Fast. "I love my hometown but Leave Fast is the way I felt when I was 17, 18 - it's that fear that I'd never be able to do something else. "Now that I am doing something else and my job is my music, I feel differently... I just knew that, for what I wanted to do, the industry isn't here, so I had to go." "I was getting wronged (being told off) by other people for playing guitar, but then he came over and asked me if I had any originals, so I started playing him some of my stuff. And he took my number that night..."